Lava flows as long as the temperature is high enough. To make sure of that, one Moroccan and two Styrian world travellers have amalgamated the primitive rocks of their musical backgrounds into new hot sounds of passion. 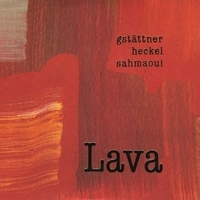 For their debut album “Lava”, bassoonist Maria Brigitte Gstättner and jazz pianist and composer Stefan Heckel founded together with the well-known percussionist and singer from Joe Zawinul’s “Syndicate”, Aziz Sahmaoui, a sensitive and visionary ensemble. The trio’s improvisation and compositions derive from the melodic richness of Styrian folk-songs and North African music. Thus emerges a completely new world of sounds through the special consonance of their specific, colourful instruments and the interaction between the peaks of the Alps and the Atlas. Every second of this recording is an exciting experience. Just like the unpredictable flow of a river of lava, the ensemble’s musical pieces roll down their own path.